Out of the Fire brings together the work of three established Edinburgh College of Art trained contemporary jewellers specialising in enamel. Ann Little graduated in 1996, Grace Girvan graduated in 2003 and Stacey Bentley graduated in 2008. Tales from the North brings together six contemporary jewellers from Scotland, Norway, Finland, Hungary and Holland. 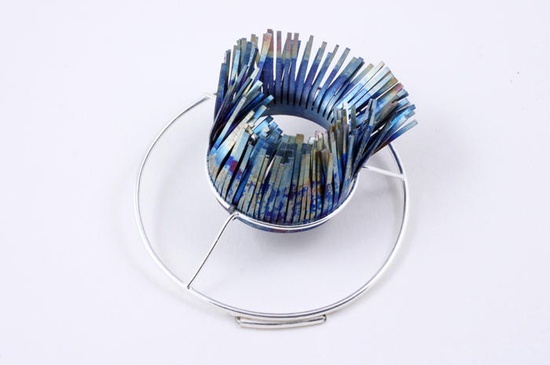 Each of the selected artists uses unconventional materials such as paper, acrylic and pebbles, in an innovative way to create beautiful wearable jewellery. The Scottish Gallery has a longstanding relationship with Nel Linssen, Janna Syvänoja and Naomi McIntosh and is delighted to welcome new artists Terhi Tolvanen, Millie Behrens and Flóra Vági into the fold. 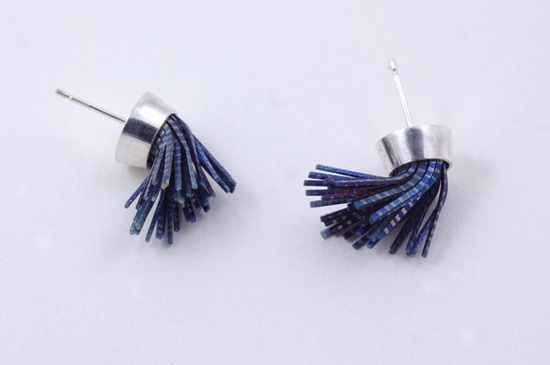 The artists are all highly esteemed within the field of contemporary jewellery and between them their work is held in over 50 Public Collections worldwide. We are delighted to present Elizabeth Jane Campbell‘s debut showcase at The Scottish Gallery. Elizabeth graduated from Edinburgh College of Art in 2013 and this is her first showcase at The Scottish Gallery. She was recently awarded the Guild of Enamellers’ 2014 Bursary and the Scottish Incorporation of Goldsmiths Bursary by Edinburgh College of Art. Elizabeth is currently Artist in Residence at Glasgow School of Art. Her creative process is informed by concepts of visual literacy. The dot, line, shape, direction and colour are all crucial factors as they act as a language for us to read and understand our surroundings. Elizabeth is attracted to enamel because of its methodical process which allows her to achieve colour, pattern and texture in a formal and structured way. Her love of this technique has led her to explore alternative materials in her work not normally associated with enamelling such as the ceramic honeycomb. 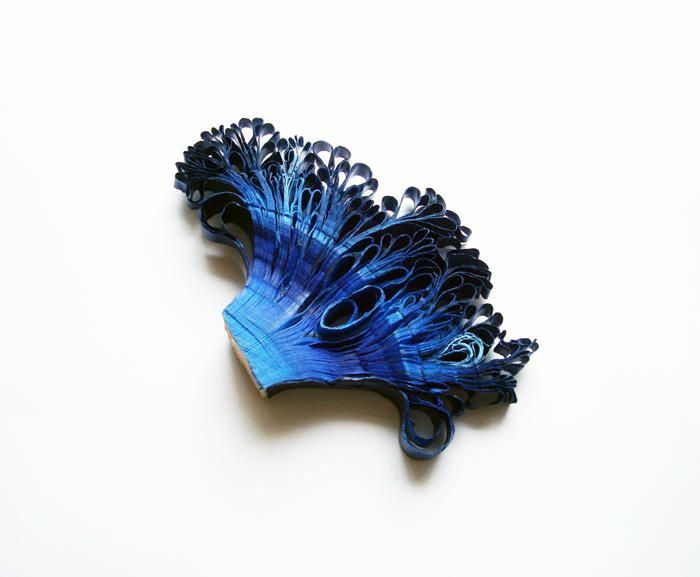 She uniquely uses this material as a carving block which enables Elizabeth to create tactile and sculptural forms enhanced by colourful enamels. Heather Woof is a recent graduate from Edinburgh College of art. Heather’s current ‘windswept’ collection has been inspired by the wild Scottish weather and is reminiscent of the powerful natural forces which shape the landscape around us. Working with hand cut titanium and mild steel the artist aims to evoke a sense of dynamism in these otherwise static materials. She tries to capture a sense of fluid movement in hard and unyielding metal, to create sculptural pieces, which appear to have been quite literally blown over by the wind. Born in Norwich 1967, he studied at Farnham then Brighton, before graduating from the Royal College of Art, London in 2001. For more than twenty years Stephen Bottomley has reflected an emerging digital age in the creation of contemporary jewellery with a quietly confident minimalist beauty. The work in this exhibition spans the two decades each side of the turn of the Millennium, a period that most clearly witnessed the gradual shift across many craft practices as digital possibilities were explored and accepted. Clarity of line, simplicity of form and pattern are all trademarks of his jewellery made with the traditional skills of Goldsmiths interwoven with the then newly emergent computercontrolled tools of design and manufacture. It is work that does not rely on technological innovation alone, but has at is root an original aesthetic authenticity and a love of material. COLLECT has an enviable reputation as a premier, annual fair for contemporary craft. Through its presentation of work from the best international applied artists, COLLECT has become a prestigious event in the international cultural calendar gaining the respect and support of many private collectors, museum curators and galleries. This year, for the first time, the work of each artist will be complimented by a photographic installation curated by a renowned Italian photographer, Mario Guerra, in which the jewellery on display will be interpreted from an artistic viewpoint, so as to create an ever closer connection between the worlds of contemporary craft and contemporary art.